MacBook, PowerBook, iBook, and other portable computing is covered in The 'Book Review. iPod, iPhone, and Apple TV news is covered in The iNews Review. What to Do with an Original 1984 Macintosh? PR: Apple takes the top spot among technology brands among American women, followed by Sony, Microsoft, Dell, and HP according to the new Women & Digital Life study by Toronto-based Solutions Research Group (SRG) in which participants were asked, "Which technology brand or company do you admire the most?" Unprompted, 20% mentioned Apple, 14% mentioned Sony, Microsoft was #3 with just over 10%, followed by Dell at 10% and HP at 6%. The SRG report notes that women are an increasingly important market for technology brands, with an estimated 45 million women in the US buying a digital product in the past six months. Other brands mentioned in the top 20 included Verizon, Google, LG, Nintendo, Samsung, Gateway, AT&T, Panasonic, GE, IBM, BlackBerry, and Comcast. Apple's dominance was pronounced among young women 12-24 (2-to-1 over Sony), while Sony and Apple were head-to-head among women 25-39. Among women 40+, Apple and Microsoft were head-to-head for the top spot. However, Sony took top spot among African-American women, while Apple was the top "top-of-mind" tech brand by only a small margin among Hispanic women. The SRG researchers found that Sony's PlayStation enjoys a very high profile among African-American women, which contributed to the win over Apple in that subset. "As women close the gender gap in technology use, being top-of-mind is more important than before," said Donna Hall, codirector of the Women & Digital Life study. "Teens and young women influence their parents' choices, while moms make choices for themselves and their children, suggesting strong potential for additional Apple products in the home." 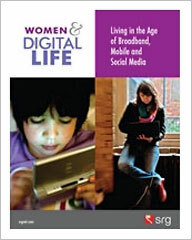 One-in-three (~45 million) US women bought a digital lifestyle product in the last six months. Among moms, 44% did, and among women 25-39, 42% bought a digital product. Walmart and Best Buy are the top two destinations for purchases accounting for over 60% of women's purchases. Target and Apple Store are among the top five retailers for women. Reasons cited for giving Apple top spot included the company's record of innovation, ease of use of its products, and particularly the iPod. Respondents perceived Apple products as "innovative, catchy, diverse in appeal for all ages & social groups," and the company itself won praise for "always improving on and coming up with great, reliable new products," and making "so much fun and cool stuff these days, and everyone can trust them." Sony was most-frequently associated with quality and reliability over a long period, as well as diversity of its product lineup, while many of those mentioning Microsoft talked about their positive impression of Bill Gates, and in particular his philanthropic activities, with the longevity of the company also receiving frequent mention. "...since September last year, we have a new method, using a small boot CD called boot-132. If I understand it all correctly, it uses a modified Darwin kernel to bootstrap a regular, unaltered Mac OS X Leopard retail disc. Since Darwin is open source, this is completely legal, and doesn't break the DMCA since you're not actually hacking any protection measures." 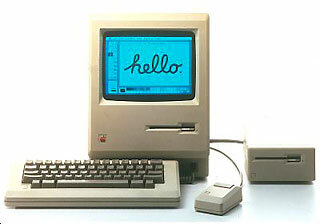 "I bought myself an original Macintosh the one from 1984 this weekend. I saw it on the streets of Williamsburg for $35, almost completely new, and I couldn't resist. Now I want to do something with it. "Now I'm having a dilemma." 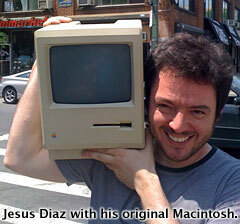 Link: What to Do with an Original 1984 Macintosh? "Join us for a trip down memory lane, and learn how the Mac evolution led to the Apple revolution." PR: It's already ramping up to the back-to-school preparations season, and if you're a college student or a faculty or staff member at any grade level and buy a new Mac before September 8, Apple will spot you a free iPod touch. For details, shop the Apple Online Store for Education, call 1-800-MY-APPLE, or find your favorite Apple Retail Store or your local Apple Authorized Campus Store. The Apple Core's David Morgenstern warns that newbies to the Mac platform finding older Mac OS X install or system restore discs in garage sales, flea markets, or on eBay may imagine they can install the software on their Mac, but unless that particular version of the software is newer than the original install version for their computer, "it is a very bad idea to click the install button." Morgenstern cites Apple's caveat that while the system versions appear to be identical, the software may not be exactly the same, and that this can be true for retail and bundled versions of the same version number of the OS, such as the Leopard or Tiger install discs. Using bundled system restore disks to install OS X on anything but the specifically designated hardware is particularly risky - and often won't work at all. Also, if your Mac is newer than your OS X installer, the latter will probably lack certain key drivers for your hardware. Register Hardware's Nick Hawkesmoor says that whether you dive in to USB 3.0 as soon as you can or wait until there are plenty of devices out there than can take advantage of it, you'll probably find the move from USB 2.0 to USB 3.0 as smooth as upgrading from USB 1.1 was, but there are a few points to consider, since USB 3.0 is something of a departure from 2.0 from both technical and practical standpoints. While backward compatibility has been a priority focus of development efforts, USB 3.0 is not simply a higher-clocked USB 2.0. Hawkesmoor notes that USB 3.0's raison d'etre is to increase data-transfer rates by a factor of more than 10x from what USB 2.0 can manage, - from 480 Mbps to 5 Gbps. Achieving that data rate has required hardware changes. Notably, skinny, unshielded cabling that's fine for USB 2.0 will not do for USB 3 and must be replaced by shielded, multicore Shielded Differential Pair (SDP) cables, which will be thicker than those we're used to, and maximum cable lengths will be reduced from 5 metres (16') to 3 metres (10'). USB 3 has twice as many pins and can simultaneously send and receive data, something older USB standards cannot do. Hawkesmoor also observes that while Apple hasn't made any public announcements about USB 3 adoption, he expects that it's working on the technology, "given its keenness on the Universal Serial Bus and general desire to be seen to be adopting technologies like this ahead of the curve." We've just released a pair of ebooks, both by Joe Kissell, that help you keep your Mac running well. The first, "Take Control of Maintaining Your Mac, Second Edition" looks at how to start on the right foot with keeping your Mac running smoothly, and then it explains weekly, monthly, and yearly tasks that anyone can perform easily to enjoy peak performance and avoid pesky problems. Along with telling you what to do, it includes a section about what not to do, explaining several time-consuming tasks that don't provide any real benefits. The second ebook, "Take Control of Troubleshooting Your Mac," version 1.1, goes beyond maintenance to teach you how to solve any problems that might pop up. In particular, you'll learn how to perform 17 specific problem-solving tasks (including clearing caches, running disk-repair utilities, and checking your RAM), how to solve 9 common problems (including printer problems, mouse problems, and Mac-won't-turn-on problems), and how to proceed if you encounter a novel problem. Each of these ebooks sells for $10. PR: MacEase Software announces that it has worked with Kagi to create TheMacBundles.com. TheMacBundles.com combines a unique cooperative marketing model and very low order processing fees to create a win-win situation both for developers and for consumers: Developers receive an equitable distribution from the sale of their software while consumers get the lowest prices available for great programs. MacEase Software announces that it has worked with Kagi to create a new model for marketing software that represents a win-win situation both for developers and for consumers: Developers receive an equitable distribution from the sale of their software while consumers get the lowest prices available for great programs. Relatively small developers of shareware and commercial software rarely get significant access to the retail channel. When they do have an opportunity to get widespread exposure for their software, often it's at the cost of receiving only a minuscule percentage from the proceeds generated from the sale of their programs. This creates an inequitable situation for developers that both stifles continuing development of existing software and discourages the creation of innovative new software. Consumers also lose, because reduced competition leads to higher prices and reduced development leads to fewer and less innovative software options. Bundles on the TheMacBundles.com will contain only highly regarded software (often award-winning software) - there will be no "filler" titles in the bundles. Also, each bundle will contain only the latest version of each title and new bundles will be offered on a regular basis. Because part of the goal of TheMacBundles.com is to provide an opportunity to introduce high quality but lesser-known titles to as many consumers as possible, each bundle will be available for only a short period of time - generally only two or three weeks - and the same programs usually will not be offered more than once a year. Especially in these difficult economic times, it's important for consumers to get the best value for their dollar and for developers to receive a fair payment for their work: TheMacBundles.com eliminates the middlemen and brings consumers and developers together to their mutual benefit. In advance of the launch of the first bundle, a Mission Statement has been posted on TheMacBundles.com. PR: Have you ever wondered, why Apple's TimeMachine takes so long to back up your files? Where all that free space on your backup drive went? BackupLoupe provides a convenient way to browse your backups and identify files/folders whose content changes frequently. Often, those items are temporary files or cache folders which need not be backed up in the first place. You may consider excluding them from TimeMachine backups and save valuable disk space. The QuickView panel, that you know and love from Leopard's Finder, helps you separate important stuff from garbage. PR: Mathusalem is a simple backup system for Mac OS X Leopard, which can be used either as a System Preferences pane or directly as a command line tool. This project is not updated anymore as of March 2009. Version 1.6 is the final version of Mathusalem.